JAKARTA – In a few rides, she learned to skate. And in the first staging of skateboarding at the Asian Games, Margielyn Didal wowed everybody with a golden performance. 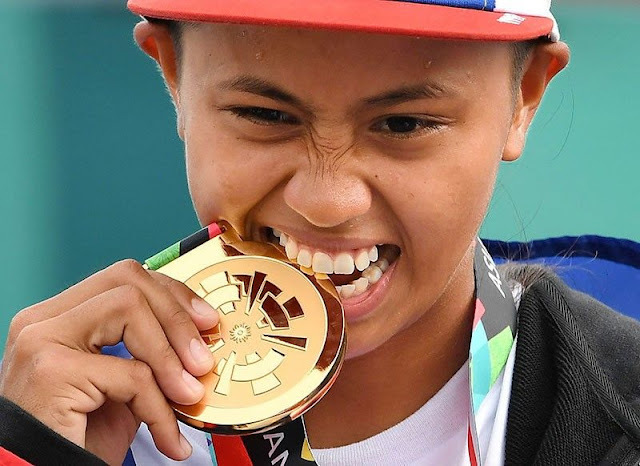 The 19-year-old Cebuana proved as good as advertised, outperforming seven rivals in a showdown in the women’s park event at the SkateBoard Stadium in the Jakabaring Sports City in Palembang yesterday. Didal was a wonder on the skateboard, displaying a daredevil attitude in a breathtaking show that made her the hands-down winner of the event with 30.4 points against the 25.0 of closest rival Kaya Isa of Japan. The rest of the competitors failed to breach the 20-point mark, with two even scoring below 10. “I am very happy. I did my best and I’m happy I won. I’m happy not just for myself but for all the skateboarders in our country,” said Didal, whose historic triumph netted her a total of P6 million in incentives from the government and private patrons. “Kung gusto pa natin ng maraming medals, suportahan natin ang skateboarding,” she added.The former street kid thus joined the elite roster of Filipina gold medalists after Hidilyn Diaz nailed the first in weightlifting last week before Yuka Saso took golf’s individual gold and – with Bianca Pagdanganan and Lois Kaye Go – steered the Philippines to team championship, both in come-from-behind fashion, last Sunday. “We are ecstatic about Margie Didal’s victory. It’s my first time to watch a skateboard competition and it’s breathtaking. Thank you Margie. You did us all proud with your daredevil performance,” said Philippine Olympic Committee president Ricky Vargas, who flew from Jakarta to witness Didal’s performance. “When she was first introduced to us, we were instantly impressed with her vibrant disposition and positive attitude that betrayed her humble Cebuano roots. At once we decided she was worthy of support. I hope our remaining athletes draw inspiration from her and our other medalists. Laban pa, Pinoy!” Vargas added. With support from the MVP Sports Foundation, Didal, daughter of a carpenter and a street vendor from Lahug, Cebu, was able to attend a Minneapolis skateboard camp to enhance her skills before competing in the Xtreme Games then in the elite Street League Skateboarding Pro Open in London early this year. What she learned from her exposure in Minneapolis and London came in handy at the Jakarta Games. “Thank you MVP Sports Foundation. MVP Sports is very positive about us. We didn’t have the money when we went to London. MVP Sports ang tinakbuhan namin. Thank you too to Siklab Atleta by Mr. Dennis Uy. Thank you for believing in us,” said Philippine skateboarding chief Monty Mendigoria. 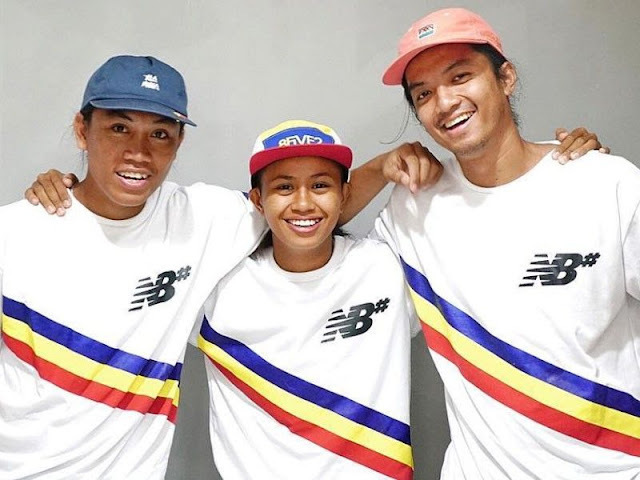 With her training and experience, Didal proved to be in a class of her own in the Asian Games. She set the tone of the lopsided contest with an opening score of 6.7 points, highlighted by a difficult “board slide” on the railings after taking the higher platform. With her 8Five2 yellow skateboard, she displayed her own version of hang time with an “Ollie” on her second run to go comfortably ahead with 14.4 points to the second-running Isa’s 13.3. In the tricks section where the two best scores out of five tries count, Didal went full throttle with another “board slide” to net 6.0 in her initial run, took it easy with a 3.7 output in the second before wrapping the gold up with eye-popping scores of 7.1 and 8.9 points in the third and fourth attempts. With a flair for the dramatic, her coup de grace was an acrobatic “backside 50/50, 360-degree flip out” that wowed the crowd. Two Philippine male skateboarders, Jeffrey Gonzales and Renzo Mark Feliciano, vied in skateboard men’s street but failed to make it past the qualifying round.